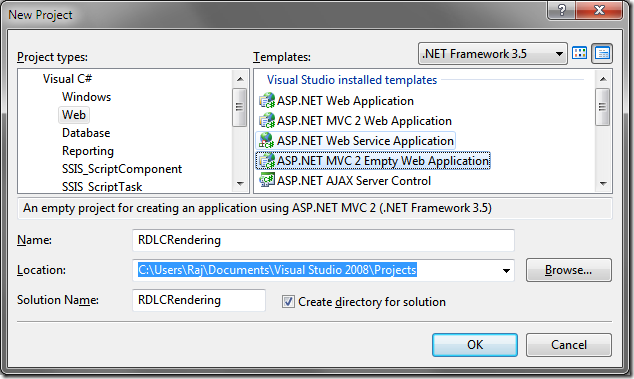 The following post shows you how to render an RDLC (Client Report Definition File) in a MVC project. 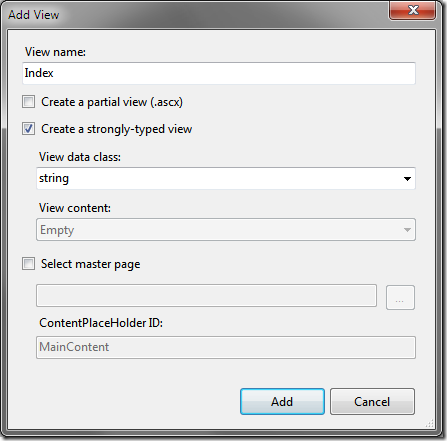 For this tutorial, I am using VS 2008 with MVC 2 Beta. I will also be using the priceless Northwind database and the report will contain a list of customers in the Northwind database. A sample project zip file is provided at the bottom of this post. 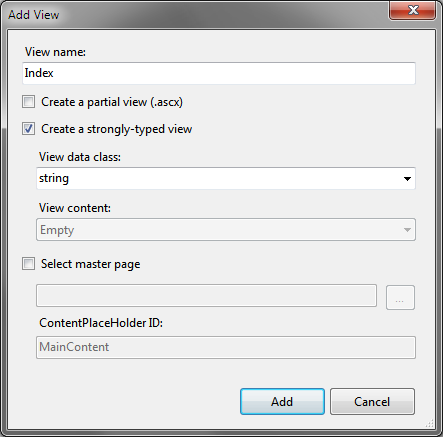 We start off by creating an ASP.NET MVC 2 Empty Web Application. 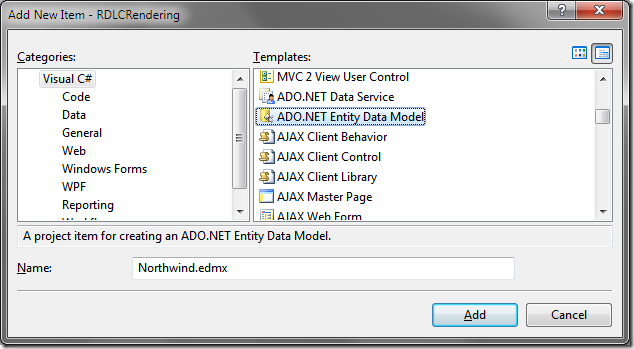 Add a new ADO.NET entity model and choose the option to “Generate from the database”. 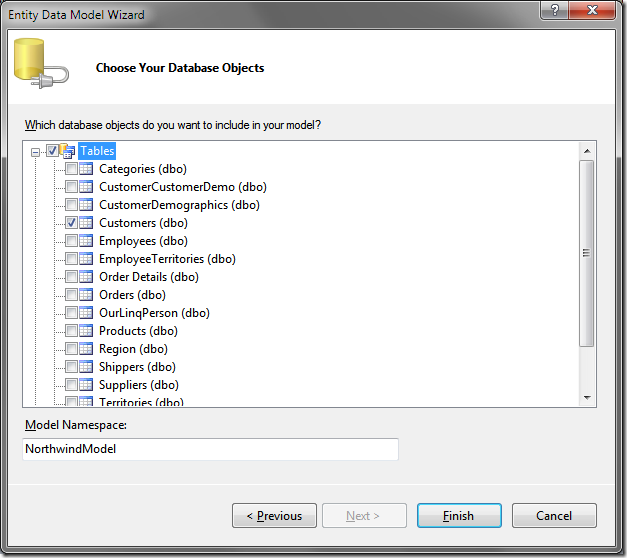 Choose the database objects (Customers for our scenario) and hit finish. We see that a new entity data model has been created in the Models directory. 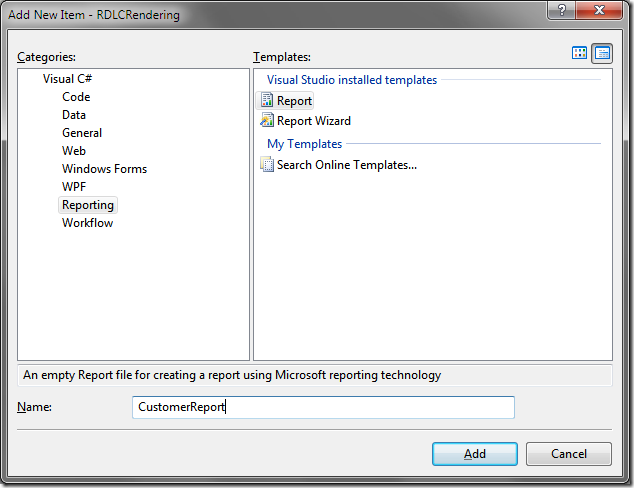 Create a folder called Content and a subfolder called Reports and add an RDLC into this folder. I hate working with Datasets and hence will not be using the “Report Wizard”. We choose the “Report” template instead. Create a method that returns all the customers in the database through a Customer partial class and add this in the Model folder. Design your report by adding a table from the toolbox and dragging and dropping fields from the Website Data Sources (reference). We will now construct our basic MVC web application. The app will have a home screen and a link to view the PDF report of Northwind customers. Right click on the "Index()” method and select “Add View”. If you click on the link you will get a “The resource cannot be found.” error. This is because our Html.Action link refers to a method called “DetailsReport” in a CustomersController which does not exist yet. Note that we are using the ActionLink overload(linkText, actionName, controllerName). First add a reference to Microsoft.ReportViewer.WebForms in your project. 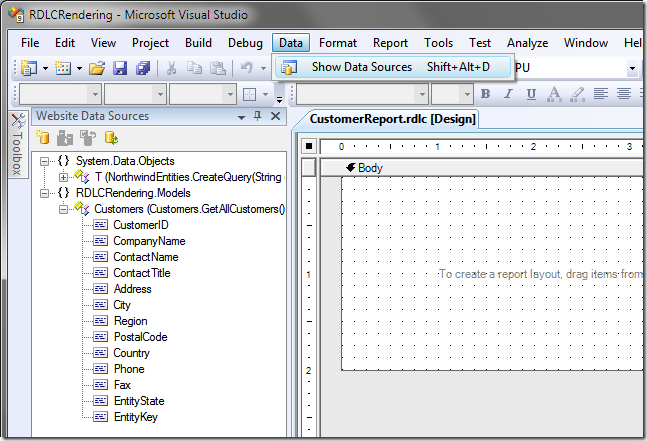 This method will create an instance of the LocalReport class, set the Report path property, add a ReportDataSource which points to the GetAllCustomers method we defined earlier, set the report output type and page dimensions, calls the render method and invokes the File method on the Controller class. This method return a FileContentResult which sends the contents of a binary file to the response stream. If you wish to prompt the user to download the PDF file, uncomment the “content-disposition” line and recompile. I've tried this in MVC 2 but get a security exception about partially trusted code. I have tried adding [assembly: AllowPartiallyTrustedCallers] but that has not worked. I've searched online for answers but haven't found anything that works. 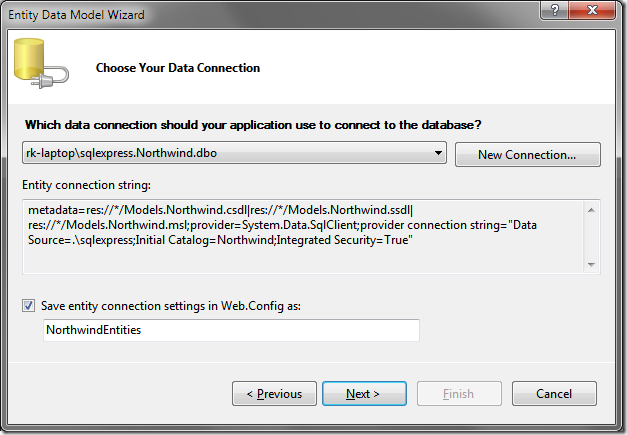 I'm using Visual Studio 2010 Ultimate, and cannot find the option "Website Data Sources"